Disclaimer: Written for love, not for profit. Although in my heart, these characters do not legally belong to me. They belong to: Melinda Metz and Laura Burns who created them, Jason Katims who developed them, 20th Century Fox Television and Regency Television who produced them and the WB and UPN who broadcasted them. Acknowledgements: How could I not thank Melinda Metz & Laura Burns for creating such magnificent characters? How could I not thank Shiri Appleby and Jason Behr for incarnating such a beautiful love? I would also like to thank O2Shea from the bottom of my heart. Your priceless contributions and feedback made this story possible! Also, thanks to RoswellOracle for the beautiful banner. "Race ya home, pooch," Max said, before he started running at full speed on the stony mountain trail. The dog gave an excited bark and breezed after him. Seconds later, he could only see the dog's tail waving at him in the distance. When Max finally reached the fiƒnish line, the dog was lying on the steps, grinning like an Olympic gold medalist, and panting much less than its master. "If not for your golden coat, I'd say you were a greyhound," Max chuckled. "Come on, you must be as thirsty as I am." The dog trotted cheerfully alongside Max, looking toward him often, so as not to lose sight of his master. He opened the door that led to the backyard and turned on the hose so the animal could quench its thirst. After a quick shower, he grabbed the car keys: "Let's go, pooch, it's time to pick Liz up." Half an hour later, Max was parked at the gates of the University of California, watching a steady stream of students going in and out. The endless ocean of human beings didn't hinder his senses, though; he could feel Liz's enthusiasm resonating in his soul, and he knew that, even though her work was over, he would have some difficulty getting her to focus on more mundane things than Molecular Biology. The dog whimpered softly in the back seat, never taking his sharp eyes from the imposing University building. Max whispered: "Settle down, it won't be long now…"
Indeed, a minute later, Liz emerged from the crowd, and the dog barked with joy when he saw her heading towards the car. She opened the door, and Max heard Maria's voice on the cellphone. "So it's settled: barbecue this Saturday." "Let me ask Max, he's right here…" She put the cellphone on speaker and moved it closer to her husband. "I don't wanna hear anything about patient rounds at the hospital this time…" Liz raised an eyebrow at Max, as a subtle blush colored his cheeks. "I've already convinced Isabel and Jesse, so no excuses from you, mister!" "You got it. Saturday! We'll be there." Max assured her. "Did you tell Maria you'd be at the hospital last weekend?" Liz asked, hanging up the phone. "Just a little fib…" He shrugged slightly when Liz looked confused. "I had promised that weekend to you… to us!" "Well, she could see right through you," Liz sighed. "I know, but we had a great weekend, didn't we?" he asked, with a playful smile. "Yeah, it was so worth it!" Max laughed as she threw her arms around his neck and pressed her lips fervently against his, letting her books and briefcase slip to the car floor. The dog panted calmly in his seat, waiting for his turn to greet her, as if he knew he shouldn't let his enthusiasm interrupt their moment. Their long kiss ended gently, and Liz's hand reached the backseat, searching for soft fur. The dog lowered his head and nudged his muzzle on Liz's shoulder, asking for a cuddle. "It's good to see you, boy! How are you doing today?" He gave an excited whimper and licked her cheek, moving forward, almost falling in her lap, and shaking himself all over with sheer joy. Liz raised her hands to protect herself from that savage attack of canine tenderness. "Okay, boy, okay, I'm glad to see you, too!" She laughed. "He looks so much better than the raw-boned fellow we found by the side of the road, doesn't he?" Max smiled, handing her his handkerchief. She leaned back in her seat. It had been an interesting day, three weeks ago. On his way from the hospital, Max had made a detour to pick his wife up at the University because her car had been stuck in the shop with engine problems. Liz remembered her husband’s sharp brake when he had noticed an injured dog by the side of the road, just outside San Francisco. After a brief exchange of words, doubts gave way to certainties as to whether they should save the animal from the tragic fate that awaited him; the poor pup would’ve succumbed to internal bleeding, unable to move its hind legs to seek help, if Max hadn’t healed his wounds. When they resumed their way home (after leaving the dog in the care of a veterinarian) Liz had smiled and had told him in jest: “He’ll be in good hands! And our secret is safe. It’s not like he’ll tell the vet he was saved by an alien.” They knew the dog was something special when he overcame the insuperable task of finding two perfect strangers miles away from where he had been healed five days before. They put ads in the newspaper and spread flyers throughout Pacifica in an attempt to find his owner, but got no response. And so, they kept him. And so, Max opened the car door inside the garage and the dog jumped gaily behind him for another day. Being healed was the source of his imperishable loyalty to Max. He never left his side. During the first couple of days, the little pup had been an unusual hang-up in their lives, but now it was a nonissue. It was so easy for them to enjoy his spirited company. He trotted into the house, ahead of them both, to claim his domain, and Max held back a chuckle. Liz heard the dog's sigh of relief when he lay on the cool living room floor. She didn’t think it was a very good idea to let him inside the house at first, but she decided to withhold judgement for the time being. "Anyway, I can't wait to tell you what happened at campus today!" She smiled at her husband, putting the house keys on a tall chest of drawers, between their honeymoon photo and the dodo figurine, over a stack of unopened letters she didn't pay attention to. Max took a deep breath and put his hands on her shoulders, guiding her through the corridor. "Can it wait just a little while longer…? Why don't you go take a warm bath, while I prepare a little something?" Liz was hungry enough for a snack, but when Max whispered those nuanced words in her ear, she saved her appetite for what she knew would be an epicurean feast. "Just stay there for a while… Enjoy! I'll pick you up when it's ready, okay?" He said, kissing her forehead. Liz glanced into the bathroom; the delicate fragrance of a bubble bath promised a relaxation that she had needed for several weeks. She smiled at her intuition that Max was going to make her a hearty dinner. “Oh, you wonderful man!” She declared, pulling him closer for a smoldering kiss. He ran his hands along her shoulders, down her back, over her hips, enveloping her in his embrace as their kiss deepened. Liz wrapped her arms firmly around him. After a succession of caresses, Max found himself taking a few steps closer to the bathroom, spurred by the tender passion of their embrace. His mission to prepare dinner nearly faded, thanks to the magic of that body he had memorized on a long ago warm December night. A mysterious lucidity stopped him. "Before you end up in the tub with me," Liz chuckled. "Yeah," he laughed. "I should just go, and… let you enjoy your bath…" He added with a long sigh, breaking their interlude. He turned on his heel and marched across the corridor and into the kitchen. Liz couldn't help but grin at the sight of her towel, already waiting for her, along with a few scented candles and rose petals (strategically placed). She reclined in the bathtub, inhaled deeply, and closed her eyes, letting the sea of bubbles relax her exhausted mind. Upon hearing Max's footsteps, the dog sashayed through the corridor and joined his master in the kitchen. "I'll take care of you in a moment, boy. Go lay down in that corner," he said, pointing to the opposite end of the kitchen. The animal sat down and wagged his tail. “Fine, just stay out of my way,” Max said, in a resigned tone. He was a bit startled when the dog dashed across the corridor. It wouldn’t take long for Liz to get ready for dinner. Max sighed and thought to himself, It’s show time! "It smells delicious!" Liz yelled as she walked to the bedroom. "I hope it tastes as good as it smells," Max mumbled under his breath. He went on to carry the food to the dining room. "I hope it tastes as good as it smells," Max mumbled under his breath as he carried the food to the dining room. When Liz got to the bedroom, she came upon the fluffiest dog bed she had ever seen lying by the window. She bent down for a better look and was struck by the softness of the material. "You're a very lucky pup, you know that? This is a bed even I'd be proud to sleep in!" She whispered to him. The dog licked her face, as if to thank her, and lay down on the bed as she put on her pajamas. She combed her hair quickly, and set her brush next to half of a coconut shell on her bedside table. Max showed up a few minutes later. "Ready?" He asked, with a cryptic gleam in his eyes. "What are you cookin'? My stomach's been nagging me ever since I came out of the tub," she laughed. "Can't you guess what it is from here?" "Well, I know it's not an omelet…"
Max tried to disguise his excitement; his smile was as revealing as a moonless night. "Close your eyes," he said. He led his wife by the hand to the dining room in a nonchalant step. That slow, harmonious movement brought her closer to a vaguely familiar scent, but her attention was baffled by her husband's enthusiasm resonating in her soul. While that titillating scent overwhelmed her senses she knew she had walked enough steps to be in the dining room. "Okay, you can open your eyes," Max said, as he dashed to the table. He feared that her perspicacity had beaten him to his surprise, but the look on her face told him otherwise. "Does this remind you of anything?" He asked, beaming. "Our honeymoon!" She replied, returning his smile, enraptured by the banquet before her. "It smells marvelous!" She said, as Max pulled up a chair for her. "I hope it's halfway decent," he muttered, sitting across the table. Their dinner was comprised of a fish curry with basmati rice. It was a perfect meal for a romantic ambiance – a reminder of the happiest weeks of their lives. "So, you were going to tell me about your day," He asked, gesturing for her to give him her plate. "Oh, yeah, things are getting really interesting now," she smiled, rubbing her hands enthusiastically. He set the steaming dish in front of her: Max had never seen his wife so enamored by her job before. Many moons ago, Liz had asked him to explain exactly how he could heal people, though he assured her he couldn't explain the process, aside from the old 'I can manipulate molecular structures'. This mantra resounded in her mind for years, without her being able to decipher its meaning. As time went by, she even got involved in studies with sniffing dogs. Max made it look so simple but, under the microscope, it was difficult to pinpoint the chemical signature of cancerous cells. After discovering that a specific protein was a byproduct of metabolic function in cancer cells, it became necessary to label it and create antibodies that would help track and kill them without affecting their healthy neighbors. Now it was time to start testing that theory. "We'll spend a long time in lung cancer trials. If it happens as I hope it'll happen, then we'll start learning how to track all the other cells. And until we know for sure, mum's the word. We don't want any highfalutin' drug companies squeezing us dry," she said, winking at him knowingly. "Since different cancers feel differently, as you always say, there's still a long way to go," she added. "This job really tests my mettle!" "They don't know how lucky they are to have someone as clear-eyed as you in there," he said, reaching for her hand over the table, tenderly. "I couldn't have done it without you," she replied in an affectionate tone, intertwining her fingers with his. Max took a deep breath. "All that effort should end with a trip to Stockholm." "We've talked about this… I don't want the spotlight on me. I'm happier in the lab," she said. Max smiled knowingly. Liz's intrepid curiosity was what got her through all difficult times in her life. All of those puzzles about molecular biology sharpened her perspicacity. "I know… It's just… it would be kind of awesome to have a Nobel laureate in the family." "There's always hope for the next generation!" She said with a smile. Max chuckled. His wife had never been a fan of self-aggrandizing, preferring just to lead her team at the University. "So, hurry up and cure cancer already; I can't wait to retire!" Liz gave out a hearty laugh and shook her head. "Oh, come on, you'd be terribly bored without your practice." "I could always leave the hospital and teach; I've always wanted to start a mentorship program." Liz nodded her approval; his resourcefulness was one of his greatest qualities. Max was a chameleon at the hospital – everyone treated him as one of them. They had always lived their lives under a tacit agreement of not drawing too much attention to themselves, and their careers had flourished in relative obscurity. And that suited them just fine. "So, want some more?" He asked, uncovering the pan with an inviting grin. As the scent reached her nostrils, her stomach asked for an encore, as if she hadn't tasted that dish for sixteen years. She handed her plate to her husband with an impish smile. That was one of the most toothsome meals she had ever tasted. "Where did you get this fish?" She wondered, indulging her taste buds again. "The father of one of my patients is a fishmonger. He sold me this fine specimen!" "Well, congratulations! This meal really transports me. I can almost feel the warm breeze on my face!" "And the coconut water," Max added. Liz was delighted with the repast Max had prepared for her. When she couldn't think of eating another bite, she said, "Oh my, all this pampering has exceeded my expectations for a Tuesday night!" "You had a really rough couple of weeks," Max noted. "I wanted to do something special!" "You could just as easily have bought me a day at the spa… That's not the reason, is it?" She insisted, with a curious smile. Max's cheeks reddened. "I wanted to do something nicer than just a spa," he added, with a bold grin. He had been through a lot of hoops to avoid suspicion from his inquisitive and insightful wife, and her questions told him that all his months' long secrecy had paid off. Without further delay, he got up and flew to the doorway, returning at the same brisk pace with a little piece of paper in his hand. It contained a mysterious bank account with a sum of thirty thousand dollars deposited there over the last couple of months. Liz furrowed her brow. "What's this?" "It's the down payment for our house in Roches Noires," he declared with a leonine smile. Her jaw slowly dropped while Max's words triggered the wisp of a memory she had all but forgotten. The images from that distant past floated in her mind's eye. 'I would love for us to be able to enjoy our retirement here!' She had said while in her husband's arms. "I know we're nowhere near retirement, but there will always be vacations we can enjoy there as a foretaste of our new home," he added. "You remembered," she whispered, dazzled by his surprise, not wanting to admit that she barely remembered her own words. "Of course I did," he replied, full of himself. A serene smile filled her lips as she looked at that piece of paper; it was bringing them one step closer to their ultimate goal – a house in Heaven. She imagined herself enjoying the sultry afternoons of her golden years with the man of her dreams on that paradisiacal island. "That's why you went through all this trouble with this romantic dinner!" He nodded with a wide grin. "And I thought you were just nostalgic," she added, hurling herself on him, covering him in kisses. "It's not over yet," he announced. "I've got a nice coconut ice cream with our names on it!" Liz smiled at her husband's debonair attitude. "Great! Stay here; I'll get it," she said, dashing into the kitchen. Her movement galvanized the dog. When she reached the kitchen, a colorful bag caught her attention. She looked at the pooch panting quietly next to her and smiled. "You're hungry?" The dog wagged his tail. She nodded. In no time the sack was opened and the kibble dropped noisily into a stainless-steel bowl (with the purchase tag still attached). Soon, Liz returned to the dining room, carrying a full platter. She passed through the entrance hall, and noticed that Max had returned the little piece of paper to the company of the dodo figurine. "Here we go," she announced, placing the ice cream bowl in front of her husband. "Over here, Zephyr," she added. Max saw the pooch following her to the dining room corner. His gaze followed her, enchanted, as she laid the full bowl of food on the floor and whispered, "Enjoy it!" Liz let him savor his meal and returned to her husband's arms. Keeping the dog was a tacit agreement; now that he had a bed and a bag of kibble, it was imperative for him to have a name. "Zephyr is nice!" Max whispered, kissing her temple, and handling her own bowl of coconut ice cream. She leaned against her husband's shoulder (a relished gesture, repeated over sixteen years) inhaled that magnificent scent of his, and brought a spoonful of ice cream to her mouth. Although Max felt a little self-conscious about the meal he had prepared, and the ice cream didn't taste exactly like the coconut water they had used to toast their wedding, her gesture transported them immediately to their honeymoon. They remembered staring, transfixed, at the plane tickets that Maria had dangled in their eyes, while she said with a cheerful laugh: "Michael and I agree that you guys deserve a real honeymoon!" When questioned by Liz about her source of income to fund such an expensive trip, Maria winked: "I have a secret backer! But that's not important. The important thing is that you enjoy your time together. Promise?" They were caught unawares; that destination had never crossed their minds, nor did they know what to expect from their trip, but they gladly accepted the gift and packed their bags to the other side of the globe. With the first step off the plane, they felt like that they had entered another dimension… an impression that accompanied them all the way, without them being able to identify it… until they reached the hotel. When they crossed the tall resort gate, they realized that, up until that moment, they had been completely ignorant of Life's elusive meaning. From that day on, an uncharted momentum seized them, taking them to a brand new place. They were enveloped by all the tender eyes that looked back at them, all the kind words that were spoken to them, all the delicious treats that were offered to them, all the remarkable new smells that invaded their nostrils, and all the pleasurable sensations they experienced. The island had a primordial charm to it. It was full of infinitely exquisite delights; it was a physical assembly of dreams and heavenly virtues – a quintessential paradise. Every element of that place had a prodigious influence on them. Everyone, from the laundry attendant, to the room attendants, to the tour guides, manifested a genuine sympathy, accompanied by a native smile that seemed to tell them they knew what being on this earth was all about, and they seemed eager to share that insight with them. The cozy hotel staff anticipated their every desire. They noticed how often they communicated nonverbally, and one of the room attendants had asked them if they had gone there to get married. They seemed somewhat disappointed when they learned that Max and Liz had no honeymoon package. They were simply married tourists. An elderly Hindu tour guide took a shine to them and offered to show them the island free of charge. He drew them a lovely itinerary, allowing them to visit the bustle of the capital, the unmistakable and unique flora and fauna, the wonderful waterfalls and mountains, and the white sandy beaches, filled with life and peace. The island was a mingle-mangle of peoples, cultures and cuisines. They concluded that only a true Paradise would be able to accommodate so many differences in a tiny geographic space. And yet, the serenity of that place was unforgettable. Day after day, Max and Liz were more flabbergasted with the inestimable knowledge he had about the island. One afternoon, they decided to return the favor and let themselves be driven to the top of a sacred mountain, so that he could give thanks to Lord Shiva for another year of prosperity. They stood apart from the ocean of faithful, who gathered there once a year, and settled to feeding bananas to the ever-present monkeys. Out of the crowd, a curious, lean man in a saffron robe approached them, carrying a trident, a tray with a coconut, some incense, flowers, and water from the lake. He stood before them and, after saying a few French words they didn't understand, began a strange ritual. Max and Liz looked at each other, confused, but unwilling to shoo the old man away. They were unable to think of an appropriate reaction while he intoned an endless and incomprehensible litany. Their tour guide took notice and went to them, but he didn't dare to interrupt the ceremony. The couple soon realized they were the object of something big when their guide provided a coconut to the strange man. To them, the ritual was a blur after a few spectators gathered to witness the event, mesmerized. The scrawny old man broke the coconut in a single blow and seemingly offered it to them. Their confusion only increased when he said an unintelligible mixture of English and French words. He picked the two jagged coconut halves, put them in their hands and guided them together. When the two halves fitted together, the man bowed and smiled. He reached for Max's hand, and then Liz's, and they stood there for some time… Their confusion didn't take anything away from the solemnity of the moment. After a few seconds of silence, the old man said in a thickly accented English: "As long as you stay with this coconut, God will keep protecting you. Forever!" Sensing their nervousness, their tour guide approached them surreptitiously, and muttered: "He is a holy man. Don't fear, he's just blessing you." The old man mumbled a few words to the guide, and the young couple saw his jaw dropping. Many other jaws from many other witnesses that had gathered around them dropped as well. The holy man was gathering more attention from the faithful who left the festival. Sensing their increasing nervousness, the man folded his hands in the Namaste gesture and bowed slightly, before leaving them. He took his tray, while the people around him called the warmth of the candles for themselves. Max and Liz got into the car with the sounds of the faithful and the temple bell chiming in the background. For over five minutes, no one dared to say a word, but it was clear their tour guide was exhilarated. Max leaned over in his seat and asked: "Can you explain to us what happened back there?" "Who was that man?" Liz asked. "It's probably incomprehensible to uninitiated like yourselves, but that man was a holy man, a sadhu, a hail-fellow, respected and venerated by devout Hindus, including the priests in the temple. He's closer to achieving spiritual liberation than any other Hindu in that festival. He's closer to God than any of us. That's why he's so sought after." "Okay, but why did he come to us?" Liz insisted. "He must've seen something in you, something that caught his attention." "What did he say to you before he left?" Max asked. The guide widened his smile and said, as if reading a royal proclamation: "He said that Lord Shiva had come to you long before he did, and he just wanted to give thanks to the Almighty for blessing you first." Max and Liz looked at each other, and then to the respective halves of the coconut they were holding still. "Even if you don't believe in the Dharma, I beg you not to dismiss his words. Let me tell you… people come from all over the world to get a chance to see him and ask for his blessing!" Even though the sanctity of the sadhu's gesture went right over their heads, they didn't dare to get rid of the coconut. The morning after the festival, they were bestowed with a complimentary breakfast (courtesy of the manager!) They learned then that news of the event had propagated throughout the hotel in a matter of minutes, and it had made them notorious with the staff for the remainder of their stay. "Yeah… we were treated like gods over there," Max said, with a sigh for his empty ice cream cup. Liz let out a nostalgic chuckle: "We had never been so pampered before…!" She stretched her limbs and gave an exhausted yawn. He wrapped his arms around her and kissed the top of her head. "Okay, I guess we're done walking down memory lane for the night." It was true that she craved her bed and a good night's sleep, but being in her husband's arms, savoring the sweet memories of their honeymoon, made her fight the weight of her eyelids. It had been 16 years since anyone had taken care of the dishes for them… Their honeymoon was a glorious, all-expenses paid little paradise, the only time they didn't have to constantly look over their shoulders, and it served as a preface of their new life as a couple. During those rapturous days, they laid the groundwork for the rest of their lives; they decided to invest their energies in fulfilling their goals and dreams. "Easier said than done," their parents had said over the phone, but later assured them they would support them in any way they could. They gathered all their money and willpower and traveled to England, with the goal of studying in the best university Her Majesty could offer. Liz remembered the day when they both had met on Broad Street, trembling and sweating, and had hugged and kissed each other silly, with their admissions papers fluttering high in the sky like a victory flag. They immersed themselves in their studies but, despite their engrossing academic life, they still used their free time to earn some money to escape the wonderfully claustrophobic accommodations of Trinity College. Even at the brisk pace their lives moved, they found a house with a low down payment, and, by the second semester of their second year, they moved to their very first home. Day by day, the weight of their prestigious education and two part-time jobs to support the house sapped what little spare time they had for each other. At the end of the second semester they had spent almost three days without seeing or talking to each other – either because of work, sleep, or because they didn't want to interrupt each other while they were studying for exams. After the initial shock at her appalling action, he abandoned the house and went back to Trinity College, but it took him more than a few days to process the fact that, by giving up their English home, they were now roofless and penniless. That was the closest their relationship ever came to a breaking point. Max had the wisdom to not lash out his anger and frustration, while Liz had the presence of mind to not put her foot down on the subject. She remembered the myriad of doubts and fears that assailed her when she couldn't find him in school, and the enormous relief she had felt when she'd seen him a day later, amidst the ocean of students at lunchtime. But when he invited her to a study session, and she saw the other half of the coconut on his desk, she felt an enormous weight coming off her shoulders. Before they opened the books, they had a frank discussion about the subject. Liz confessed her fear that constant financial pressure and lack of time for each other would undermine their relationship; Max was certain they were able to overcome any obstacle! Yes, it would be difficult, it would be prolonged, it would require lots of patience, but in the end, they would overcome it. She wiped her hands and yawned after putting the last plate on the dish drainer. A familiar sound caught her attention as she walked towards the bedroom. She pushed one end of the curtain from the window with a finger and saw them on the lawn. Max ran after Zephyr to steal the tennis ball in his mouth. Then, in a change of tactics, he decided to hide behind a bush. The dog searched him with his eyes, but quickly dropped the ball to find his master with his nose. Max ran swiftly to catch the forgotten ball, but the nimble pup stole it from him, barking with the ball in his mouth, strutting away. Liz grinned and shook her head, Two kids horsin' around, she mused. They were lucky that their little town was of inestimable tranquility, and the neighbors didn't mind their nighttime romp. At times like these, she became aware of the weight that Time had over them; they had been together for 16 years: through sleepless nights, through long months of strenuous work, through countless weeks of study, through irritating weekends of fever, through years on end, in weal and woe, to accomplish their goals and dreams. She was startled by the key turning in the lock. She smiled as she saw them coming through, panting and grinning… Max's exhilaration was visible in every pore of his being as well as that of the dog! He stopped in his tracks when he saw her in the living room. "I thought you'd gone to bed," he said, with a sheepish smile. "I decided to wait for you," she answered, revealing a knowing grin. "You must be thirsty from all that frolicking," she said to Zephyr, and went to the kitchen to get him some water. Their new family member followed her and quickly quenched his thirst. Liz leaned on her husband and put her arms around him. "It's great to see you enjoying your time with him!" She was grateful that he had learned to relax, to not overextend himself, as he had during his years in medical school. 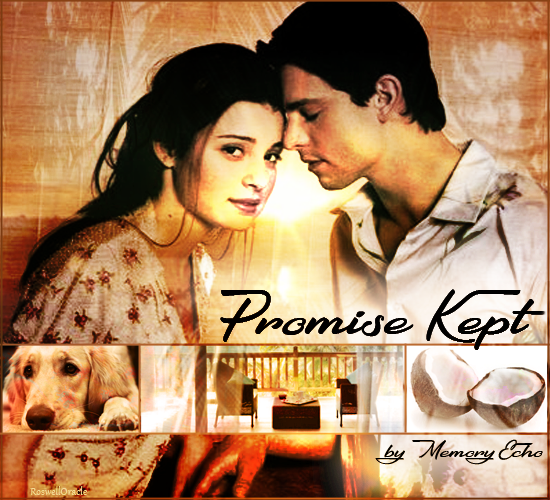 They walked towards the bedroom, leaning on each other with Zephyr trotting right behind them. "Tomorrow, I'm taking him to the vet, and then I'm getting him a license," Max said. "I think it's the right thing to do. Don't you agree… darling?" Liz chuckled at his nostalgic reference. "Yeah, I think it's the right thing to do… dear!" In the bedroom, Liz closed the blinds while Max unstrapped his wristwatch, setting it down on his bedside table next to his half of the coconut. Then, he knelt next to the doggy bed, and tried to coax Zephyr to lie there. Liz concealed a smile when Zephyr perched on Max's legs and began licking him, ignoring his flinty order. "Come on, boy, come to your bed. Over here," Max repeated, patting the doggy bed, before the pup made him lose his balance and nearly sit in it. "It you don't resist his cuteness, you'll be the one sleeping there," Liz commented, with an unintentional chuckle. "I guess," Max replied, asking for her hand to escape the pup's adorable assault. Liz helped her husband up and then snapped her fingers at the dog. "Zephyr, over here," she whispered, pointing at the bed. The pup lowered its head and walked to its doggy bed; he rolled around a couple of times before he lay down and breathed deeply. "Complaisant little fellow, isn't he?" Liz said, surprised at him. "How did you do that," Max asked with a raised eyebrow. "Oh… dogs are hierarchical creatures by nature… and this one knows who the leader is!" Liz replied with a coy smile. "I see," Max muttered, glaring at the dog with a glint in his eyes. "Oh, don't look offended; he's completely crazy about you," she assured him, throwing her arms around her husband. "You're just a big softy, and I wouldn't want you any other way," she added, with a disarming smile. The dog wagged his tail and raised his head toward Max, as if he was agreeing with Liz. "Okay… I guess I can accept that… I'm gonna wash my face now," he said in mock shame. Liz knew better; healing the dog was just part of Max's innate kindness, but he didn't like to boss him around, so why would the pup look to him for leadership? When Max came back, Liz was all tucked in. At the bathroom's door, he smiled, seeing his wife all nestled between the sheets. He petted Zephyr one last time, and the pup licked him goodnight. He entered the bed very carefully and heard his wife muttering, "I hope you don't mind that I started without you…"
Max leaned over and gave her a gentle kiss on the temple. "Sleep well," he whispered. Max felt a nausea rising up through his esophagus, filling him with a dizzying sensation, and he decided to flee the room. He dragged himself to the bathroom, his legs barely cooperating, feeling his stomach twist in knots. When he finally arrived, he closed the door behind him, curled into a ball with his head in his hands and whispered, as the tears stung his eyes, "Oh my God, not this!" Thousands of macabre images and sensations steam-rolled through his head, stealing his breath; years upon years of suffering and agony he had seen in the hospital with his patients… It was easy to care for his patients and then come home to his healthy life… But seeing the suffering coming into his house was a turnaround that baffled and sickened him. There was a sad irony about it: witnessing patients dying or being brought back from the brink of death on a daily basis should be enough to make him callous to these things, but the thought of losing his wife to any disease (much less cancer!) was something he couldn't bear. Those thoughts were strangling him. He realized that, if he kept his heartbeat at that speed, Liz would feel it through their connection and wake up. The thought only made his heart beat faster… He tried taking a deep breath and leaned over the sink for a few seconds. He poured cool water over his face and met his own eyes in the mirror. Calm down man, he ordered himself. This is ridiculous! Why are you getting so worked up? Since when do hospital rules apply at home?! He grabbed the towel to dry his face, remembering the day he took the Hippocratic Oath during the White Coat ceremony… He had taken another oath to his wife, later that day; he solemnly swore on his honor not to use his alien powers to heal any patient… But his closest friends were left out of that pledge! So, it was illogical for him to get so bent out of shape over something he could extinguish over a few seconds of molecular manipulation. He had been inculcated with these concepts for so many years that he was turning a bit paranoid. He hurried back to his room with renewed confidence and climbed into bed, murmuring to himself, I'm just gonna eradicate the cancer cells; I'm not gonna wake her up. I'm not even going to worry her by telling her about it tomorrow! He quickly located the growing tumor. Granted, it wasn't very big, but cancer is a capricious condition… its cells chaotically reproducing and invading healthy cells… Even if it was benign, it had no place being there! Max took a deep breath and focused his powers to destroy that growing curse, but when he was about to surreptitiously disintegrate the corrupted cells, he noticed something odd… The tumor was small enough, but it behaved like none of the neoplasms he knew about. Of course, it was too early for Liz to have any symptoms, or for him to know how it would evolve… He remembered the advice of one of his professors, "When in doubt, cut it out." He had to admit that its behavior was puzzling him; he couldn't find the specific signature that could tell him exactly what kind of cancer it would be… He had studied over two hundred types of chemical signatures of all the different cancer cells, but this was completely new! He didn't want to risk a misdiagnosis. He fidgeted in bed, uncertain of what to do next… This is why doctors shouldn't treat family members; our minds get blurred, and we can't be rational, Max mused, massaging his temples. He sighed; this was the time he used to bounce ideas off with his wife… If it's not cancer, what could it possibly be? Think horses, not zebras, he wondered, imagining Liz asking him that question. "Can you feel it?" Max asked, with a love-filled gaze. Max nodded. Liz pressed her hands over her womb, fascinated by the energy emanating from it, and Max put his loving hands over hers, doing nothing to contain his tears. "She already scared the living daylights out of me!" Liz looked at him, confused at first, then concerned, as the tears streamed from his eyes. "Oh… I've spent too many years as an oncologist… I should have been an obstetrician," he mumbled, wiping his eyes with the back of his hand. "No, I'm kidding. It's much more fun to bring people back from the brink of death! The only person I want to bring into this world is her." "Her?!" Liz ask, her tears also falling. "Or him… I'm not picky, as long as it looks like you!" He gazed at her, with a smile spanning both ends of a rainbow. "Thank you so much! You made me the happiest half-human in the Universe!" Liz had never heard him speak two octaves higher than normal. They had been dreaming of this moment for eons, and she knew she could count on his staunch support. "I'm the one who'll bring this little miracle into this world!" "You're fit for that, right? You're not an OB, and I just don't want you passing out and missing…"
"Don't worry, I won't miss an event like this! Besides, I know a thing or two about anatomy, I'm sure I can make it work! I'll be the first to say 'Congratulations, mommy!'" Liz widened her own grin. "Hey, to both of us, right?" The two of them snuggled up to revel in their youthful miracle… Its journey through the uterus enfolded them in its warm presence, enthralling them to happy tears. When the little miracle attached itself to the wall of the uterus, Max repeated, proudly: "Congratulations!" She kissed him fervently, celebrating the corollary of their connubial bliss, yearning for the new journey that was just beginning. Last edited by memory_echo on Tue Dec 12, 2017 5:00 pm, edited 1 time in total. WOW, so many things happened here! but I'm not going to spoil! wonderful! Sweet. A nice little story, and Max and Liz were perfect in it. You did a great job! saori_1902 and Parker1947, thank you so much for your feedback! I'm delighted that you enjoyed my little story! By the way, I posted something on Tumblr connected to "Promise Kept". I alluded to Maria and Michael paying for the honeymoon, but I never went deeper than that, because I thought it would deviate too much from the main story. Don't know what happened to the feedback I thought I had left? Anyway, thank you for sharing this wonderful little story. Loved the special pampering Liz got.......on a Tuesday! Of course Max is just perfect in every way. Now a wonderful new adventure is on it's way.